Power Surfacing strength lays not only inside Solid Works (SW). In combination with MODO it the quickest, cleanest, and also least expensive work flow to create a high-end industrial level product. Spanning from product design, to manufacturing, to rendering out stills and animations of the product for marketing. This is all possible because of nPower's Power Surfacing plug-in for SW. Paul McCrorey work illustrates the power of this suite of software very well; visit http://www.mccroreydigital.com/. To realize this workflow, it took a little bit of time. For my work, I have used CNC machines to output large private and public projects for the last ten years. These projects have sculptural elements that rotate and light up using microprocessors, motors and high powered lights. In my constant search to find better processes that allow technology to be part of the creative workflow and not a hinderance, I started with SW. As many SW users know, output from SW allowed me 100% of what was sent to the machine to have no errors, or very little comparable to other software. After several years of working with SW, I realized that all my needs could not be met in a single program. In SW, regardless of the learning curve, surfacing had limitations. So I started looking at MODO, a newer SubD modeler that merged with The Foundry (great merger). MODO is a completely different beast but extremely powerful. SubD modeling has been around forever and has the flexibility needed for animation but not the precision needed for manufacturing. MODO has a great set of modeling tools that are robust and complex but still manageable to use. Combine this with MODO's falloffs, action center, the super fast creation of multiple planes of any part of geometry; it allows you ways of creating forms that you might not even think of in SW. Minus all the impressive technology included in Power Surfacing, the decision to have the software translate the info native in SW is it's true strength. I have worked with Geomagic, which is good for scanning and then cleaning but have always felt like I am trying to catch up to get to a final result. Power Surfacing really puts me in the drivers seat, allowing me to plan ahead for how the shape gets designed. The newest and greatest craze of 3D printing and affordable CNC output machines are all about chasing down the magic forumla that generates precise data that allows for great prints or machined objects. This is where Power Surfacing really is truly amazing. If you know anything about subD models, the more Quads or polygons with four verts, the better. But what happens in most workflows? You go to triangles, .STL file. Makes no sense. It is like driving a Formula One race car with a remote control. I state again, I would rather be in the driver's seat. This allows you to be native in both programs, making your workflow more controlled and easier to edit at any point. You make a clean .obj in Modo that has both curved surfaces and tight edges that then to bring it into SW using power surfacing, is a thing of beauty. You get a clean solid that still can be manipulated inside SW. No longer do you have to re-export the file from it's native program. Working model After the idea is complete the work begins. 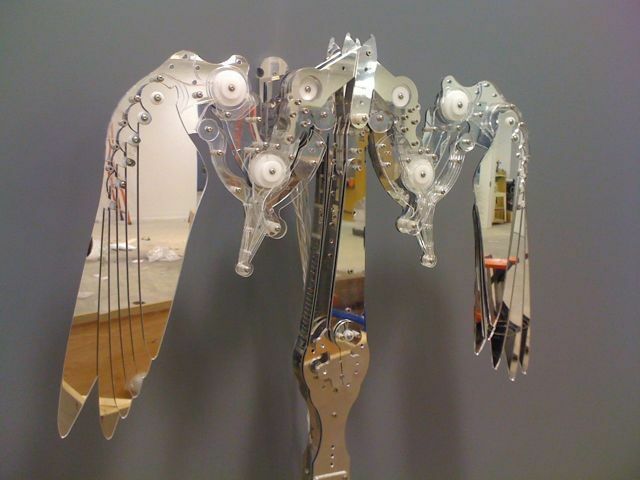 In 2006 the idea of mechanically articulating motion of wings came to me. Only currently, 2009, the project has taken off, no pun intended. I was in a cathedral in San Juan, Puerto Rico, looking at the angels with their wings spread pointing skyward. The light was pouring through the large front door. As the light flickered and moved so did the shadows that fell off the wings, accenting the space between the wings. I noticed the negative space became more important then the positive shape. Light / Shadow , negative/positive , real /illusion blur. Bizarrely, I found op art in the most unforeseen location, a cathedral. This is yet another off shoot of familiar themes that are prevalent in previous projects. The images show the work in progress which sometimes seem to be more interesting then the final product. The Process of mechanical mistakes and then engineering, re engineering and reverse engineering is similar to the pencil marks that rough out a drawing. Every artist these days has more than a simple aesthetic, they have their own mythology to promulgate. It’s as if they want to present their art work not only as an example of their creative qualifications, but to manifest elements across the spectrum of their artistic history as individuals. The determination of quality being highly subjective, we are required to engage ourselves with the work on hand to such a degree that its mythos becomes evident. In the drawings and sculptures of Erik Guzman, we are presented with work which depends upon, and in some cases actually produces, a light source. Think of the light bulb going off in the thought balloon of a cartoon character. Other sources of light are less allegorical but no less mimetic, such as the sun pacing its track across the sky, developing a notion of transience and duration even as it falls prey to the same immutable forces. The sense of alarm, an interruption of daily life to manifest a sense of eventfulness, is the paramount element in any of these circumstances. Light as controlled by man often has an illuminating (sic) aspect which its natural origin does not. Guzman’s sculptures and bas-relief drawings are unique in my experience of art. They seem to have emerged out of the genre of Science Fiction, specifically one in which hieroglyphics and celestial machines both have a place. I can see references to films such as 2001: A Space Odyssey, Tron, and The Terminator. Yet I also relate them to Walter M. Miller’s A Canticle for Leibowitz and Frank Herbert’s Dune. Each of these works of literature or film, and the narrative subgenres to which they belong, presents us with a highly mythologized view of reality. What Guzman’s work shares with them is his love of the opaque and the mysterious. In Clarke’s (and later Kubrick’s) masterpiece, 2001: A Space Odyssey, we are given an alternate timeline to history in which an ominous presence, floating on the edges of humanity’s experience since the days of the caveman, makes itself known. The monolith object operates as a sort of cenotaph on man’s road into the future, marking a flashpoint at which a certain detour must be observed, in order that at least one destination be reserved for persons other than mankind. On the way to this moment, a series of transformations take place through which we are made to feel overwhelmed by transcendent powers. But what takes precedence in the perception of such events is also evident in Guzman’s work: an understanding of manifest visual conditions that overwhelm logic. The mythology evident in Guzman’s oeuvre takes two routes: the narrative of epics and the mystery of symbols. One may choose either route from which to find meaning. The narratives are oblique yet dynamic, and are etched in horizontal glass panes which sit on little ledges hung on the gallery walls to the left of the first room, and on the right are a set of hanging structures which are illuminated from within but seem to have the glass panes suspended behind cloth strips, so that light passing through them creates a subtle shadow resembling a watermark. The specific markings in the glass panes are oblique to say the least, and feature epic scaled sites which house events of metaphysical or spiritual grandeur: what appears to be either an endless building or a road stretching to infinity, interrupted by a swarm or infestation of small flowing creatures which seem vaguely elemental, as they are accompanied by glowing stars and seem to appear out of a rift in space. A more common figure is the silhouette of a man’s form, just his upper torso and head, with light emanating from him as he travels through a series of labyrinthine spaces toward a grand godlike figure whose own silhouette seems to merge with the fabric of reality, becoming less present while at the same time all-powerful. 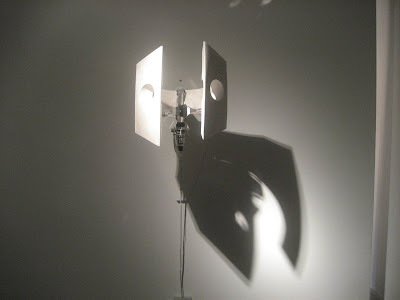 Guzman’s sculptures, which are installed together in a second room, are arranged so that the physical space needed for each, and its own projecting light, does not interfere with the others. As one walks around the room one discovers that the programmed movements of each is generated by a motion dictator, as if we were interlopers in a strange crypt. 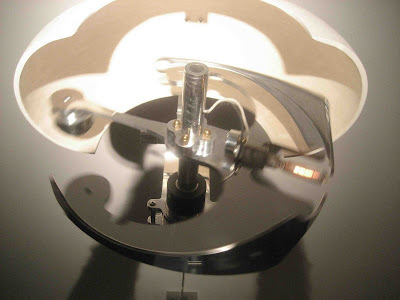 The machines themselves seem to be fashioned from a combination of metal and ceramic material, and they utilize a lot of open space, with portals in the surface so that one can look into the machine as it operates its specific and oblique function. All the metal parts are shiny and gleam in the aura of their own illumination. Approach one machine and the moving part arcs back and forth, with a light inside of it flashing on and off with a dreamy regularity that is almost serpentine. Another starts revolving very quickly, while another seems to fold up into itself, like an armadillo. The intermingling of a passive mythological element with the dynamic cultural content of wireless entertainment most commonly used in video games but having implications far beyond them is what gives Guzman’s work its rigor. We have always looked to machines for knowledge. The difference between actual machines such as the microwave and the Walkman, and imaginary ones such as jet-packs and laser guns, is often a matter of degree. Each of them extends the reach of what man can do. One of the implications of such far-reaching ability is that it will begin to resemble godlike proportion. The machines in Erik Guzman’s art are like a new species, making the first uncertain gestures into existence, instinctually marking space and extending the range of metaphor for how we see ourselves. Perhaps God is nothing more than a well-designed machine. If so, Guzman helps us to see the light. VERNISSAGE, TV. the window to the art world. The latest addition to Berlin’s art fair landscape is Bridge, a fair that is already present in London, Miami and New York. In Berlin, the fair is located in an apartment complex in Schönhauser Allee 5 in Berlin Mitte. Most exhibitors come from the US like the Brooklyn-based Front Room Gallery which presents the kinetic sculpture “Who made Who” by Erik S. Guzman. Among the exhibitors and projects are also Collectiva, Häppi Töle, and Momus, who will be presenting the result of his rice experiment this Sunday at 5pm (interview with Momus coming soon). BROOKLYN—Erik Guzman’s finely crafted kinetic sculptures are both mysterious and challenging, and the three created for his current solo exhibition, “Who Made Who” at Brooklyn’s Front Room Gallery, are no exception. Much of Guzman’s work is participatory. Relying on motion sensors, his machines start spinning as you come close to them and, in each, a high wattage bulb lights up. 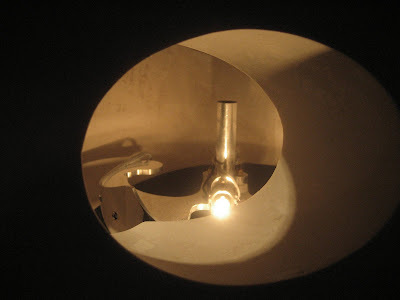 While the three pieces have a similar metal armature, they have distinct aqua-resin casings and personalities: Beacon, the Watcher’s spinning bulb picks up steam and then slows; Beacon, the Decider’s wobbles slightly and moves at a constant rate; and Beacon, the Thinker’s moves at a more leisurely pace. The bulbs cast shadows across the room, and the beauty of Guzman’s forms and the delicate rhythm of his engineering create a Zen moment. Like some of Matthew Barney’s sculptures, Guzman’s intricately built devices could belong to an alien race from a parallel world. 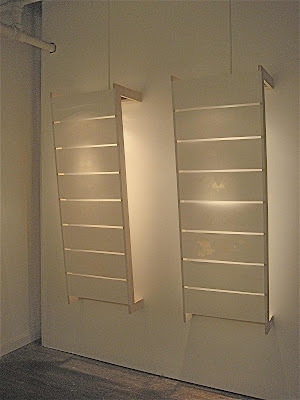 In the second gallery, a series of laser-etched glass panels lean against the wall in wooden mounts. Incredibly thin and detailed lines form shapes and patterns that evoke gears, church architecture, Japanese temples, and Guzman’s own mechanical sculptures. 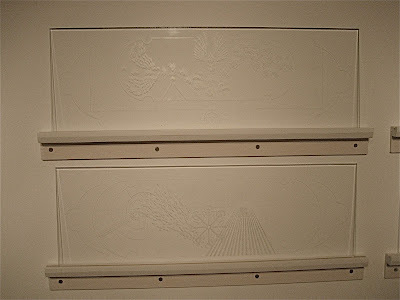 On the opposite wall, the same imagery is repeated in backlit laser etchings on sheets of paper that are displayed on wooden frames reminiscent of ancient Japanese screens. The overall atmosphere of this show is like the laboratory of an old-fashioned, hands-on artist-inventor. PDF OF ARTICLE published in the Visual Arts Journal. The Front Room gallery is pleased to present “Who Made Who” a solo exhibition of sculptural work and drawings by Erik Guzman. This September Guzman will unveil an impressive body of new work that is a realization of artifacts and ideas from a self-composed mythology. Kinetic, light emanating sculptural work paired with delicately detailed etched glass drawings, illustrate Guzman’s mythos of the machine. Featured in this exhibition will be three sculptural works which incorporate dazzling light, polished aluminum and plexiglass; activated by the presence of a viewer, rhythmic light patterns consume the architecture of the gallery as spinning wheels cast long swirling shadows across the floor and onto the walls, that gradually form, take over the space and then subside. 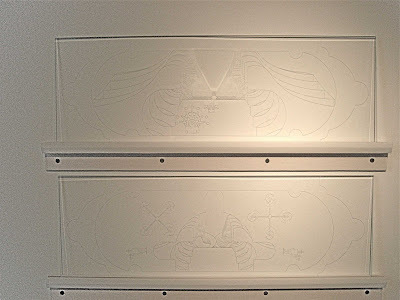 The accompanying etched glass plates exemplify Guzman’s aesthetic, which combines graphic icons, church architecture and components from Japanese patterns and temples. Guzman’s ethereal etched glass panels exist in the minute space fractions of an inch from the wall. The etching is transparent, the glass all but invisible, but the fine lines cast unearthly graphic imagery onto the wall, the drawing is made from the diffusion of light, sharp lines defined from shadow. Erik Guzman has been active as an artist in Williamsburg, for 9 years. Among many professional accomplishments are his LMCC GAPS grant award, Cue Foundation residency, LMCC space grant, a Joan Mitchell nomination. He has exhibited nationally at Smack Mellon, El Museo Del Barrio (S Files), Front Room Gallery, Soap Factory, Hillwood Museum, Dumbo Art Festival, The Kitchen, Exit Art, St. Marks Church Gallery. International exposure includes shows at Museo de Arte de Puerto Rico, El museo de arte de Caguas, El Museo de Las Americas, Gallery Tezz, Tokyo, Japan. Erik Guzman is also a founder of Goliath visual space, a nonprofit artist run organization, which has served as both protagonist and presenter of emerging artist since 1998. The thing for the thing. Very important piece. The art production begins. aka, "time to make the donuts"
First out of five profiles needed to complete the shell. The not so finished piece. Then sand, sand, sand, sand..... you get the idea. Then sand some more. Pure chaos. I can not explain the part of the project. Daniel helps me test the shell. Did not fall on the floor. Good sign. Nicolas helps with install. Many thanks. Shelves by Nils. Craftsmen extraordinaire. The Front Room Gallery is proud to present "Summer Sampler", a tantalizing treat featuring works by the last season's Front Room artists as well as a preview of the shows to come, and some splendid new selections. Amanda Alic and Ethan Crenson, film a new installment of their October 3rd videos every year. For Summer Sampler they will offer October 3rd, 2007. The couple set up outside of the New York Public Library and asked passers-by to tell us a joke in any language. Polish, Hebrew, German, Wolof, Spanish, Hungarian, Serbian, Pular, Igbo, Farsi, French, Russian, Norwegian and, of course, English speakers have offered jokes since the project began in 2001. The project seems to suggest the rigor of a conceptual exercise, but the subject has a less austere quality. The jokes may not be universal, but the telling of them has a quality seems so. Sasha Bezzubov and Jessica Sucher's series "The Searchers" examines various aspects of Western spiritual tourism in India and features large scale photographs taken at sites including the Osho Meditation Resort in Pune, the Divine Life Society in Rishikesh, and the Mahabodi Temple in Bodh Gaya. Bezzubov and Sucher investigate the lure of India's rich religious history in utopian communities, yoga centers, and meditation retreats that cater to Western seekers. Engaging with the visitors of these locations and immersing themselves in the subculture of spiritual experimentation, Bezzubov and Sucher create spatially astounding images that encompass the visual strangeness and cultural collisions of this phenomenon. "The Searchers" consists of several series of photographs that present these themes through portraiture, landscape and abstraction. Greg Curry, In his paintings Gregory Curry has invented a new biology. The behavior of the organisms from Curry's world of super day-glow greens and oranges is seemingly put under the microscope and we become privy to the existential struggle they endure. This nebulous environment might shroud their identities, but their purposes are often much clearer than their scale or surroundings. They are refugees, assassins, congregations of similar organisms and menacing loners. In these paintings the body has been expanded, contracted, manufactured, reworked and jettisoned. These paintings utilize familiar modes of representation: rendering, classic spatial relationships and perspective to familiarize these forms in spite of the taxonomic meltdown they are undergoing. Lisa DiLillo's video and photography series entitled Encounters both focus on similar themes. The photographs depicts situations occurring along the increasingly porous borders between "natural" and human habitats. A cultural cross-contamination occurs as both worlds are altered by the presence of each other. 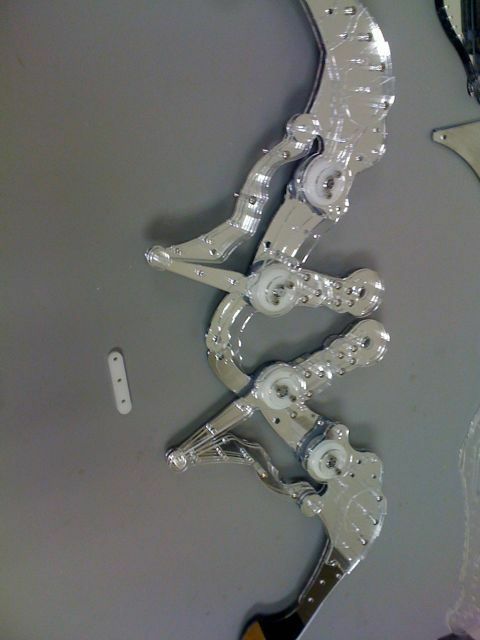 Erik Guzman, Erik Guzman's artworks consist of a multitude finely cut parts of aluminum, glass and plastics. Each of these material elements converge to create mechanical devices that rotate, point, generate sound, and illuminate without obvious or logical results. A marriage between craft and movement allows for an aesthetic to evolve that is independent of the two. Sean Hemmerle, In Hemmerle's photographs the political situations are remarkably tangible in the landscape-the often sad and complex stories embodied. In these solitary, forsaken landscapes the streets are often dead ends marked by a cul-de-sac, a massive and improbable wall bisecting the street and blocking our visual lines. Hemmerle's photos show the physical manifestation of ideological differences and the political desperation, that once deemed intractable, are made concrete and expressed through the architecture. By photographing international zones of contention he shows the landscape of discord, and the architecture erected for this specific division. Melissa Pokorny, By using overtly artificial means to represent space, coupled with uncannily realistic animal figurines and casts, Pokorny questions our estrangement from, and subsequent longing for connection to the natural world, and the resulting substitution of the real by the fake. Alan Packer's extensive and impressive body of work examines elemental and cultural ideas. Packer relates his experiences and travels through large-scale sculptures that revive lesser known cultural ideas. His travels have taken him to the northern regions of the Arctic circle, cultural centers of Paris and New York, the Rocky mountains, the wilderness of Banff and ancestral Wales. During his extended stays in these communities Packer broadened his cultural ideas, incorporating theirs into his own. His elegant constructions combine industrial materials with elements that reference natural world, unifying the mechanical world of industry's focus on rigorous time keeping and the less tangible system of the life cycle in nature. Sante Scardillo, Through his work with newspaper articles, headlines, and magazine advertisements Scardillo reclaims the public space the media uses for their marketing, and exposes a hidden message of compliance. He questions both their strategies and implied political aims. In his work Scardillo uses found text and images from the media and alters them, completely changing their perceived meanings. Scardillo's work brings the hidden meaning to the forefront, and uses the glossiness against itself, or simply isolates headlines, effectively creating cultural slogans. Philip Simmons merges contours of American imagery, defining new icons for this century. His elegant silhouetted forms revel in the machismo culture so particularly American with the glorification of the wild west, gunfights between cowboys and indians, soldiers, and ultimately war. These glamorous shapes, of super high-gloss resin take us back to a simpler time of drive in movies and enameled gas station signs with logos of roaring tigers and Pegasus. Their content, however, is not lemonade stands and sock-hops. They are violent and aggressive, their radiant surfaces depicting savage animal attacks, gun fights, and bomb blasts. Patricia Smith's meticulous, quietly subversive works on paper commingle elements of architectural drawings, medical illustrations, and antique maps. Labeled with text captions, these imaginary structures address the anxieties of contemporary life and the coping mechanisms that develop in the collective psyche. Mark Stilwell uses painted and reclaimed packaging, byproducts of the over-consuming society he portrays, in this scene of terror. Crowds of paper cut-out citizens run screaming from the devastation and hostile creatures that are overtaking the city. Edie Winograde, Winograde's photographs tap into an American cultural memory, a visual memory created not so much through historical study but by television, movies and Western paintings. Place and Time creates a portrait of the present-day phenomenon of the reenactments as well as an impression of historical and legendary events, blurring the boundaries between now and then, history and imagination. For more information please contact: Daniel Aycock (718) 782-2556. Sirena de huracanes: propuesta de maqueta del proyecto a escala 1/3.Localización: Museo de arte de Caquas, Caquas PR. Colección permanente. Descripción: escultura cinética con rueda giratoria luminosa de material reflectante. La rueda se haya parcialmente insertada sobre una cubierta semiesférica reflectante colocada dentro del muro de exhibición. La intensidad de la luz y velocidad de rotación de la rueda incrementa con la proximidad de la tormenta. La maqueta/ prototipo Hurricane Siren/ Sirena de Huracanes es una propuesta de proyecto para el Museo de Arte de Caguas, mi ciudad de nacimiento. a pesar de mi marcha de Puerto Rico a una temprana edad siento ahora un gran interés por mi país de origen. La investigación realizada para este proyecto sobre los orígenes de la ciudad de Caguas me encamino hacia los indios Taino. La naturaleza ocupa un importante lugar en la religión local. Al ser una isla, los huracanes y temporales cobran una especial importancia. La naturaleza se haya en el centro de la cultura local. Guabancex, la diosa de las tormentas, atrajo especialmente mi interés. el proyecto Hurricane Siren/ Sirena de Huracanes hace referencia al faro que la diosa dejo en la tierra para avisar a los habitantes de la isla de la proximidad de las tormentas. La escultura cinética estará en constante movimiento. Cuando una tormenta se aproxime la velocidad e intensidad de la luz incrementaran. Constituirá una señal de aviso, una sirena, que informara a los visitantes de lo que les depara la naturaleza. 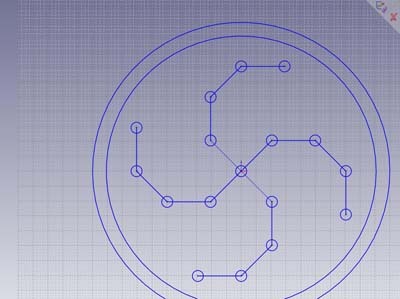 La escultura estará conectada a Internet para recibir los datos meteorológicos que dictaran su comportamiento. El proyecto hace uso de la tecnología moderna para reconectarse con la naturaleza. Por favor, clica en la siguiente imagen para reproducir el video del proyecto. Hurricane Siren: Sirena de Huracanes, Hurricane Siren model, 1/3 working scale. Proposed location: Museo de Arte de Caquas, Caquas PR. For the permanent collections Description: Kinetic sculptural object that has a reflective rotating wheel of light. The wheel is mounted to the wall via a curved reflective shell. As a storm approaches, the light and speed of the piece will increase. Hurricane Beacon / Faro de Huracán prototype proposal is for the Museo de Arte de Caguas. Caguas was where I was born. Even though I left Puerto Rico at a early age I am curious about where I came from. I started to do research about the origins of the city which led me to the Taino indians. In their religion nature seemed very important and being on an island hurricanes and heavy rains were of major concerns. Nature was the center of the culture. Guabancex, goddess of storms particularly interested me. The proposed project, Faro de Huracán, represents her beacon that she left on this earth to tell the people of the island that a storm is coming. 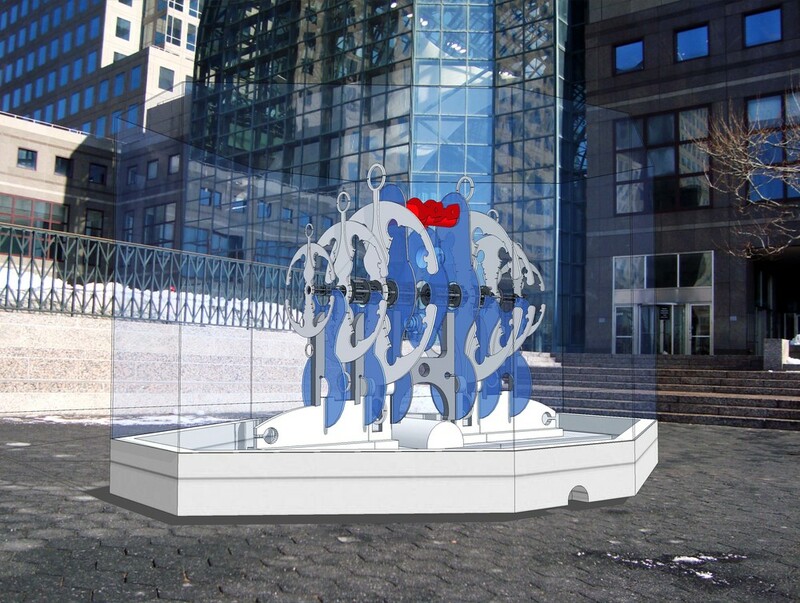 The kinetic sculpture will consistently rotate and when a storm approaches the light and movement will increase. It will be a beacon telling what nature has in store for the viewers. The project uses internet access to the collect the information needed to govern the sculpture. It uses modern technology to connect back to nature. Click on Image below to see MOVIE. I made the original idea/plan in Sketchup. It is easy to use and it functions as a great sketch pad. People can quickly see what you want to make but you do not have to go into every detail of what ever you are making. 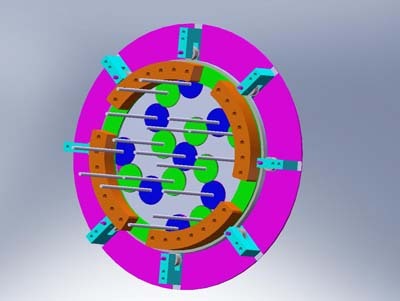 The easy and fun part is now over and I am starting the migration of the piece into Solidworks. Solidworks is great but I am always learning. The piece has four or five rotating wheels that light will be projected behind. 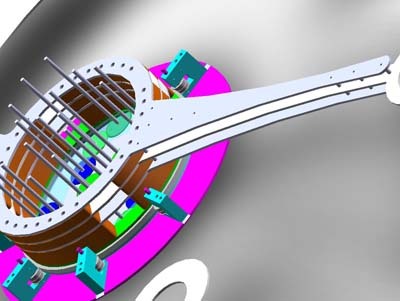 There are some major engineering issues that have to be resolved but the most major one is how to have all these rotate and keep the supporting arm completely straight. Flex is bad. After I showed what I had done to Mark, very smart person. He made some suggestions that seemed to make sense. 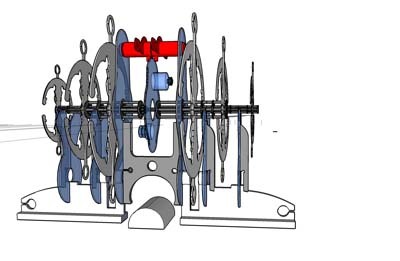 Make the functional mechanism a planetary gear system. Think of it as a all the mechanisms forming a pyramid protruding off the wall. It would be much more stronger then a pipe or rod coming of the wall. Flex would not be such a issue. hypothetically of course. So I threw out several weeks off work and started last week on a new system. It is not finished at all, but the main ideas of the mechanism is coming to light. Update: I am now rethinking the planetary gear system, but the pyramid structure idea is good. More drawings need to be done to really figure it out. Like most human I have always been interested in birds. Even birds that did not fly like the poor kiwi. I am more interested in the mechanics of the wing then flight it self. Do not get me wrong, I am still amazed when I am in the air for 14 hours. But, the mechanics are extremely complex and amazingly strong and when they are working they seem simple. Past projects have dealt with elements of rotating arms or discs with light around them moving at different speeds and orientations. With this project I wanted to get a little distance from those type of projects. When making complicated mechanical pieces it is hard to change directions. You end up generated one piece based on the previous piece. I was taking pictures of birds on the edge of Greenpoint, Brooklyn, and I noticed that all this complicated bioengineering disappeared when you saw the birds silhouette against the blue sky. The birds body and wings became a negative pattern punched into the crystal blue sky. The dance between what is positive and negative is what led me to the mechanics. The need to know how to make something that can generate something unattainable, light and the lack of it. Wings seemed like a perfect devise to project the unattainable. With all this higher use of my limited gray matter made me think about Greek myths. The story of Icarus came to mind. Out of need to escape Crete, his father made wings for both of them to escape. Over come by the feeling of flight he attempting to obtain something that was not his to have. As we all know he crashed into the sea. After thinking about all this I started to make some basic drawings for the project called, Icarus. Icarus will be a fully articulating set of wings made from glass with a rotating light source in the middle. At this point, I am not sure that I can make something this complex simple but what is generated will hopefully be interesting never the less. The work always starts to big and then slowly, over time, get more reasonable. Mini non sense in a smaller version of a earlier piece called Lost Sense. I have been making all my sculptural pieces in the computer first for the last 7 years. Starting with illustrator, then moving to vector works and now solid works. With every programs come mostly positive results. The only thing is that when you move from one program to the next you have to re-learn everything over. It seems that you never get to the finish line. 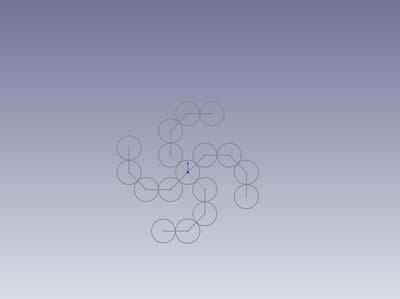 Solidworks is a great program. The learning curve was steep but like everything if you spend enough time staring at it you slowly understand it a little bit better. With knowledge gives you freedom and it is really amazing what it can do. It allows you to see your mistakes before you make them in real. It still takes just as long to figure what you are making but the results are much better. The reason that I am going into such detail about the process is that I think the piece has a certain finish and comforting scale that would not be obtained if not for the process. The scaling down from Lost Sense was the planing stage for the Museo de Arte de Caguas and CAVA store proposal. Click on the image above to view movie. This Project will be made possible by the kind generosity of the following programs and institutions and companies. LMCC's GAPS, Grant for Art in Public Spaces. Weather Beacon is a kinetic sculpture that will emit a code of flashing lights, forecasting the weather and will be situated in lower Manhattan. This weather indicator will merge public wifi, structure, movement, and light through a physical object that invites the public to connect to nature through art. Project Weather Beacon is made possible, in part, through a grant from the Lower Manhattan Cultural Council with the generous support of The September 11th Fund. Weather Beacon is a kinetic sculpture that will emit a code of flashing lights, forecasting the weather for a curious public in Lower Manhattan. This weather indicator will merge public wifi, structure, movement, and light into an object that invites the public to connect to both physical and invisible surroundings through art. From the days of the original Dutch settlement, to the landfill of oyster shells that expanded the southern tip of the island, weather and harbor activity have been major elements of life in Lower Manhattan. Through modernization, the area has moved away from this history and its close ties to nature. Project Weather Beacon will utilize modern materials and technologies to heighten the present-day viewer's awareness of weather patterns, connecting the public back to nature using modern means. The work will act as a translation tool, or oracle, that allows for the visualization of the invisible forces of nature. The project will forecast the weather by using the public wifi connection in the area. Weather data will be received and translated into a simple language that will control the project. Being connected to the Internet, the sculpture will act as a beacon for the weather, but could also be used to broadcast stock market information, solar flares from the sun, or traffic on the FDR. Project Weather Beacon can be used to visualize any system in flux. Once the piece is constructed, the information fed to the beacon can be changed to enable different collaborative projects and ways to engage the public throughout the year. After doing more research the design has changed. The main shape is still present but a lot more glass is present to show the working structure. Some simple shots placing Project weather beacon in a lower Manhattan environment, Fulton Street market and the sea port. Aesthetically, the project mirrors icons of harbor life. Long mast-like poles will extend horizontally from the center of the hull's main structure. Four progressively sized anchors will spin at different speeds along the length of the mast. Light projected from behind the rotating anchors will create an array of different light patterns. The entire structure will be encased by thick shatterproof glass, allowing the viewer to experience the project safely. A weather key that clearly states the meaning of each pattern of lights and rotations will be posted on the outer glass of Project Beacon.